This didn’t take long. Since more and more customers are starting to receive their BMW F90 M5’s, we’re seeing an increased activity concerning these vehicles. 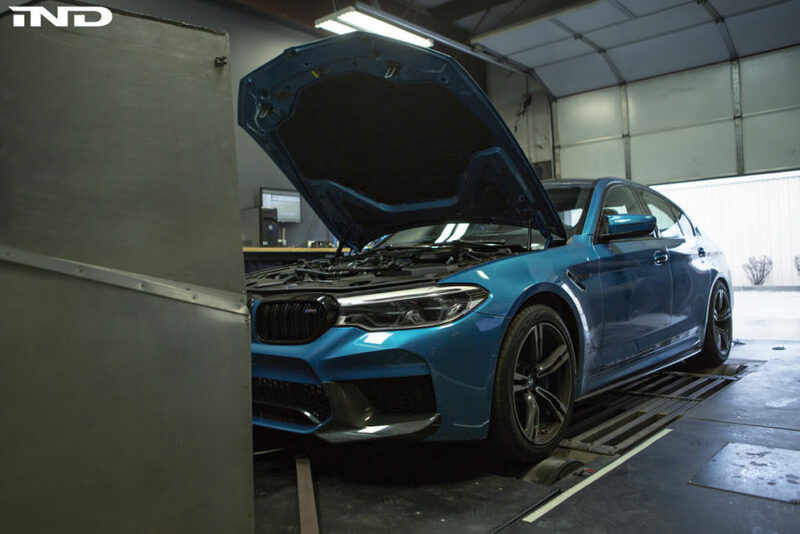 Today, IND Distribution revealed their official data from the BMW F90 M5 dyno test they’ve concluded, and the results are pretty impressive. The tuner is a well-known figure in the aftermarket tuning world, providing both cosmetic and performance upgrades for BMW’s of all shapes and sizes. 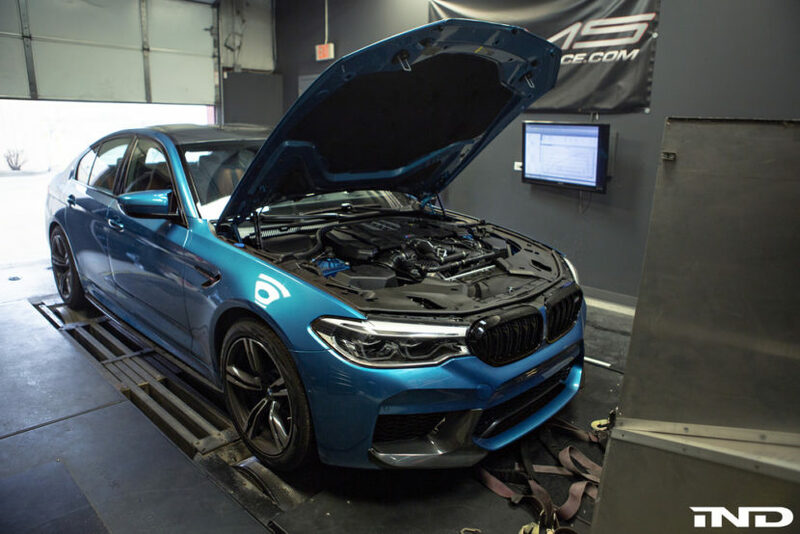 It’s no wonder that IND is one of the first companies to put the all-new M5 through its paces on the dyno. The BMW F90 M5 is powered by a 4.4 Liter BMW TwinPower Turbo engine, delivering (according to factory specifications) 600 horsepower and 553lb-ft of torque. The 8-Speed DCT (Dual Clutch Transmission) system, powering all four wheels, allows the M5 of this generation to sprint from 0-62mph (0-100km/h) in just 3.2 seconds. After IND completed the break-in period, they took their beautiful Snapper Rocks Blue Metallic BMW M5 over to AMS Performance. Curious to see how accurate the BMW horsepower and torque numbers were on the car while still 100% stock, the tuner hopped on the scales then Dynojet and soon found out. The BMW F90 M5 weighs in at 4268lbs (1935kg) with approximately 7/8ths full of 93 octane gas. BMW estimates the curb weight at 4370lbs (1982kg). After the weigh-in was done, it was time to put this beast on the dyno. Thanks to some chili Illinois weather that morning, the BMW M5 posted some rather impressive numbers. IND’s best run was in 5th gear/AWD/Sport Plus – a surprising 625 wheel horsepower and 608 lb/ft torque. According to the tuner, in all settings, the power was linear and the difference between Sport Plus and Efficient only being about 15 horsepower. Additionally, IND did one run in 6th gear in full RWD/Sport Plus mode, and hit the speed limiter at about 152mph/244kph, power maxing out at 593 wheel horsepower and 578 lb/ft torque. Judging from the above results, the BMW F90 M5 posts some impressive numbers. From what the experts in the industry tell us, the tuning capabilities of the BMW’s S63 powertrain are impressive, so it won’t take long until somebody crosses into some epic horsepower and torque number territory. Grab a detailed look at the dyno results and some snaps of the IND’s M5 right below.